This methodology is demonstrated by means of two examples. The first is a simple one and the second takes into account the various efficiencies. A PV system is using 80 W, 12 V panels and 6 V, 155 Ah batteries in a good sunshine area. The battery efficiency is 73% and the depth of discharge is 70%. If, in wintertime, there are 5 h of daylight, estimate the number of PV panels and batteries required of a 24 V application with a load of 2600 Wh. Because the system voltage is 24 V and each panel produces 12 V, two panels need to be connected in series to produce the required voltage, so an even number is required; therefore, the number of PV panels is increased to eight. Again as the system voltage is 24 V and each battery is 6 V, we need to connect 4 batteries in series, so the number of batteries to use here is either 16 (very close to 16.4, with the possibility of not having enough power for the third day) or 20 (for more safety). The second example uses the concept of efficiency of the various components of the PV system. From Example 9.5, the average DC load was 475 Wh and the average AC load was 547.9 Wh. These give a total load of 1022.9 Wh. ■ Day AC = 492.9 Wh, = (2250 + 1200)/7 (from PV system through the inverter). ■ Day DC energy is obtained from Eq. (9.44): Ed,dc = EArdist, so EA = 100/0.95 = 105.3 Wh. ■ Night DC energy is obtained from Eq. (9.45): Ed,dc,bat = EArbatrdist, so Ea = 375/(0.75 X 0.95) = 526.3 Wh. ■ Night AC energy is obtained from Eq. (9.46): Ed,ac,bat = EAlbatrinvldist, so Ea = 55/(0.75 X 0.90 X 0.95) = 85.8 Wh. ■ Day AC energy is obtained from Eq. (9.47): Edac = EArinv|dist, so, EA = 492.9/(0.90 X 0.95) = 576.5 Wh. ■ Expected daily energy requirement = 105.3 + 526.3 + 85.8 + 576.5 = 1293.9 Wh. Therefore the energy requirement is increased by 27% compared to 1022.9 Wh estimated before. One way utilities historically have thought about generation reliability is loss-of-load probability (LLP). LLP is the probability that generation will be insufficient to meet demand at some point over some specific time window, and this principle can also be used in sizing stand-alone PV systems. Therefore, the merit of a stand-alone PV system should be judged in terms of the reliability of the electricity supply to the load. Specifically, for stand-alone PV systems, LLP is defined as the ratio between the energy deficit and the energy demands both on the load and over a long period of time. Because of the random nature of the solar radiation, the LLP of even a trouble-free PV system is always greater than 0. 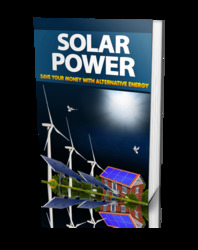 Any PV system consists mainly of two subsystems that need to be designed: the PV array (also called the generator) and the battery storage system (also called the accumulator). A useful definition of these parameters relates to the load. Therefore, on a daily basis, the PV array capacity, cA, is defined as the ratio between the mean PV array energy production and the mean load energy demand. A = PV array area (m2). r PV = PV array efficiency. Ht = mean daily irradiation on the PV array (Wh/m2). L = mean daily energy consumption (Wh). C = useful accumulator capacity (Wh). The reliability of a PV system is defined as the percentage of load satisfied by the PV system, whereas the loss-of-load probability (LLP) as the percentage of the mean load (over large periods of time) not supplied by the PV system, i.e., it is the opposite of reliability. As can be understood from Eqs. (9.48) and (9.49), it is possible to find many different combinations of CA and Cs leading to the same LLP value. However, the larger the PV system size, the greater is the cost and the lower the LLP. Therefore, the task of sizing a PV system consists of finding the better trade-off between cost and reliability. Very often, the reliability is an a priori requirement from the user, and the problem is to find the pair of CA and Cs values that lead to a given LLP value at the minimum cost. Additionally, because CA depends on the meteorological conditions of the location, this means that the same PV array for the same load can be "large" in one site and "small" in another site with lower solar radiation. where Ht = monthly average daily irradiation on the PV array (Wh/m2). In this case, CA is defined as the ratio of the average energy output of the generator in the month with worst solar radiation input divided by the average consumption of the load (assuming a constant consumption of load for every month). Each point of the CA-CS plane represents a size of a PV system. This allows us to map the reliability, as is shown in Figure 9.21. The curve is the loci of all the points corresponding to a same LLP value. Because of that, this type of curve is called an isoreliability curve. In Figure 9.21, an example LLP curve is represented for LLP equal to 0.01. FIGURE 9.21 LLP curve for LLP = 0.01 and cost curve of a PV system. It should be noted that the definitions of CA and CS imply that this map is independent of the load and depends only on the meteorological behavior of the location. As can be seen from Figure 9.21, the isoreliability curve is very nearly a hyperbola with its asymptotes parallel to the x and y axes, respectively. For a given LLP value, the plot of the cost of the PV systems (dashed line in Figure 9.21) corresponding to the isoreliability curve is, approximately, a parabola having a minimum that defines the optimal solution to the sizing problem. The LLP curve represents pairs of CS and CA values that lead to the same value of LLP. This means, for example, that for the pair (CS, CA) = (2, 1.1), the proposed reliability is achieved by having a "big" generator and a "small" storage system. Similarly, for the same reliability, the pair (CS, CA) = (9, 0.6) leads to a "small" generator and a "big" battery. As can be seen, the optimum size of the system is at (CS, CA) = (7.5, 0.62), which gives the minimum PV system cost. Many methods have been developed by researchers to establish relations between CA, CS, and LLP. The main ones are numerical methods that use detailed system simulations and analytical methods that use equations describing the behavior of the PV system. These methods are presented by Egido and Lorenzo (1992). Fragaki and Markvart (2008) developed a new sizing approach applied to stand-alone PV systems design, based on system configurations without shedding load. The investigation is based on a detailed study of the minimum storage requirement and an analysis of the sizing curves. The analysis revealed the importance of using daily series of measured solar radiation data instead of monthly average values. Markvart et al. (2006) presented the system sizing curve as superposition of contributions from individual climatic cycles of low daily solar radiation for a location southeast of England. Hontoria et al. (2005) used an artificial neural network (ANN) (see Chapter 11) to generate the sizing curve of stand-alone PV systems from CS, LLP, and daily clearness index. Mellit et al. 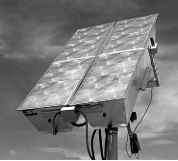 (2005) also used an ANN architecture for estimating the sizing coefficients of stand-alone PV systems based on the synthetic and measured solar radiation data. Once the LLP curves are obtained, it is very simple to design both the capacity of the generator (CA) and the accumulator capacity (CS). Depending on the reliability needed for the PV system design, a specific value of the LLP is considered. For instance, Table 9.6 shows some usual values for typical PV systems. A way to increase the effectiveness of PVs is to concentrate sunlight on small, highly efficient photovoltaic cells using inexpensive reflective material, lenses, or mirrors. These are known as concentrating photovoltaics (CPVs). Today, the technology takes up a very small portion of the solar industry; however, it is expected that the CPV industry will soon take up a larger share of the solar market as technology improves and cost comes down. The solar spectrum has photons ranging up to 4 eV. A single-material PV cell can convert only about 15% of the available energy to useful electrical power. To improve this performance, multiple cells with different band gaps, which are more complex and therefore more expensive, can be used. These are called multi-junction PVs. Particularly, a triple-junction PV produced recently achieved a remarkable 40% efficiency (Noun, 2007). This PV consists of three layers of PV material placed one atop the other. Each of the three materials captures a separate portion of the solar spectrum (see Figure 2.26) and the objective is to capture as much of the solar spectrum as possible. These are much more expensive than other silicon solar cells, but their efficiency offsets their high cost, and in concentrating systems, a small area of these cells is required. 1. They replace expensive PV material with lower-cost mirrors or reflective materials. 2. Solar cells are more efficient at high-irradiation levels. 3. Due to tracking, production of energy starts earlier in the morning and extends later in the day. FiGuRE 9.22 Schematic diagram and a photograph of a CPV Fresnel system. (a) Schematic diagram. (b) Photograph of an actual system. 1. At high concentration, cells heat up and lose efficiency, so they must be cooled. 2. Concentrating systems use only direct solar radiation. 3. The system must track the sun; higher concentration requires more accurate tracking. 4. Concentrating systems are more complex than flat-plate ones and less reliable, because they have moving parts. Usually CPV uses lenses to concentrate sunlight onto small-size photovoltaic cells. Because a CPV module needs much less cell material than a traditional PV module, it is cost effective to use higher-quality cells to increase efficiency. For CPVs, all concentrating systems presented in Chapter 3 can be used. The most popular system of CPV, however, is the Fresnel lens system. As in all concentrating systems, a tracking mechanism is required to follow the sun trajectory. Usually, a number of PVs are installed in a single box and atop each a Fresnel lens is installed. A CPV system can include a number of boxes, all put in a single tracking frame. For this type of system, two-axis tracking is required. A schematic diagram of a CPV Fresnel system is shown in Figure 9.22a and a photograph of an actual system is shown in Figure 9.22b. It should be noted that, in concentrating photovoltaics, the distribution of solar radiation on cells has to be as uniform as possible to avoid hot spots. Because the temperature developed in CPV systems is high, some means of removing the heat energy must be provided to avoid reduction in the PV efficiency and prolong the life of the PVs. In some systems, this extra heat is used to provide thermal energy input to other processes, as in the hybrid PVs analyzed in the next section. A system that can provide both electrical and thermal energy simultaneously would be a very interesting application. Such a system could cover part of the electrical and thermal energy needs for a number of applications in industry and buildings (hospitals, schools, hotels, and houses). Photovoltaic panels convert solar radiation to electricity with peak efficiencies in the range of 5-20%, depending on the type of the PV cell. The efficiency of the solar cells drops with increasing operating temperatures. The temperature of PV modules increases by the absorbed solar radiation that is not converted into electricity, causing a decrease in their efficiency. For mono-crystalline (c-Si) and polycrystalline (pc-Si) silicon solar cells, the efficiency decreases by about 0.45% for every degree rise in temperature. For amorphous silicon (a-Si) cells, the effect is less, with a decrease of about 0.25% per degree rise in temperature, depending on the module design. This undesirable effect can be partially avoided by a proper heat extraction with a fluid circulation. Natural circulation of air is the easiest way to remove heat from the PV modules and avoid the resulting efficiency drop. Hybrid photovoltaic/thermal (PV/T) collector systems may be applied, however, to achieve maximum energy output by simultaneous electricity and heat generation. In this way, the energy efficiency of the systems is increased considerably and the cost of the total energy output is expected to be lower than that of plain photovoltaic modules. The produced heat can be used either to heat the building or for the production of hot water for the needs of the occupants. Stabilizing the temperature of the PV modules at a lower level is highly desirable and offers two additional advantages: an increase of the effective life of the PV modules and the stabilization of the current-voltage characteristic curve of the solar cells. Also, the solar cells act as good heat collectors and are fairly good selective absorbers (Kalogirou, 2001). In hybrid photovoltaic/thermal solar systems the reduction of the PV module temperature can be combined with a useful fluid heating. Therefore, hybrid PV/T systems can simultaneously provide electrical and thermal energy, achieving a higher energy conversion rate of the absorbed solar radiation. These systems consist of PV modules coupled to heat extraction devices, in which air or water of lower temperature than that of PV modules is heated at the same time the PV module temperature is reduced. In PV/T system applications, the production of electricity is the main priority; therefore, it is necessary to operate the PV modules at low temperature to keep PV cell electrical efficiency at a sufficient level. Natural or forced air circulation is a simple, low-cost method to remove heat from PV modules, but it is less effective if the ambient air temperature is over 20°C. To overcome this effect, the heat can be extracted by circulating water through a heat exchanger mounted at the rear surface of the PV module. PV/T systems provide a higher energy output than standard PV modules and could be cost effective if the additional cost of the thermal unit is low. The water-type PV/T systems can be practical devices for water heating (mainly domestic hot water). Details of water PV/T systems are shown in Figure 9.23. For air systems, a similar design is used but, instead of the heat exchanger shown in Figure 9.23, the heat is removed by flowing air, as shown in Figure 9.24. FiGuRE 9.24 Details of an air PV/T collector. Two basic types of PV/T systems can be considered, depending on the heat extraction fluid used, the water-type and the air-type PV/T systems, as shown in Figures 9.23 and 9.24, respectively. The air-type PV/T systems are of lower cost than the water-type PV/T ones and are suitable for building applications in medium- and high-latitude countries. In low-latitude countries, the ambient air temperature during the day is over 20°C for almost half of the year, limiting the application of air-type PVT systems to a shorter period in terms of effective electricity production. The water-type PV/T systems can be used effectively in all seasons, mainly in low-latitude countries, since water from public mains is usually under 20°C. Usually, the water-type PV/T models consist of silicon PV modules and the heat extraction unit is a metallic sheet with pipes for the water circulation, to avoid the direct contact of water with the PV rear surface. The heat exchanger is in thermal contact with the PV module rear surface and thermally insulated on the rear side of the heat exchanger element and the panel edges, as shown in Figure 9.23. The heat exchanger in these systems is similar to the fin and tube arrangement used in flat-plate solar collectors, so the technology of this type of system is well known to the solar industry. In the systems shown in Figures 9.23 and 9.24, glazing is used and the final panels look like a conventional flat-plate collector. The systems, however, can also be unglazed, which is more suitable to very low-temperature applications. In the case of unglazed systems, satisfactory electrical output is obtained, depending on the operating conditions. The thermal efficiency, however, is reduced for higher operating temperatures, due to the increased thermal losses from the PV module front surface to the ambient. The addition of a glazing (like the glazing of the typical solar thermal collectors) increases significantly the thermal efficiency for a wider range of operating temperatures, but the additional optical losses from the glazing (from the additional absorption and reflection of the solar radiation) reduce the electrical output of the PV/T system. The hybrid photovoltaic/thermal systems are considered an alternative to plain PV modules in several applications. They can be used effectively for converting the absorbed solar radiation into electricity and heat, therefore increasing their total energy output. In these systems, PV modules are coupled to heat extraction devices, in which water or air is heated and at the same time the PV module temperature is reduced to keep electrical efficiency at a sufficient level. Water-cooled PV/T systems are practical systems for water heating. 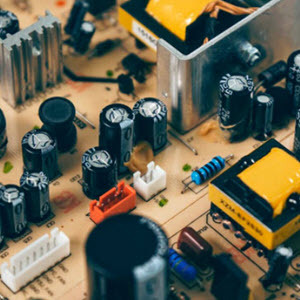 These new solar energy systems are of practical interest for many applications, as they can effectively contribute to cover both the electrical and thermal loads. It should be noted that the cost of the thermal unit remains the same irrespective of the type of PV material used, but the ratio of the additional cost of the thermal unit per PV module cost is almost double when amorphous silicon modules are used rather than the crystalline silicon ones. In addition, amorphous silicon PV modules present lower electrical efficiency, although the total energy output (electrical plus thermal) is almost equal to that of crystalline silicon PV modules. The additional thermal output provided from the PV/T systems makes them cost effective compared to separate PV and thermal units of the same total aperture surface area. In PV/T system applications, the production of electricity is the main priority; therefore, it is more effective to operate the PV modules at low temperature to keep PV cell electrical efficiency at a sufficient level. The daily and monthly performance of a hybrid PV/T system is investigated through modeling and simulation using the TRNSYS program (see Chapter 11, Section 11.5.1). Such a system provides more electrical energy than a standard photovoltaic system because it operates at a lower temperature; in addition, thermal energy is obtained, which can be used for water heating. 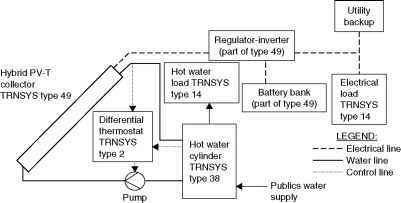 As shown in Figure 9.25, the system consists of a series of PV panels, a battery bank, and an inverter, whereas the thermal system consists of a hot water storage cylinder, a pump, and a differential thermostat (Kalogirou, 2001). In each case, the TRNSYS type number used is indicated. A copper heat exchanger is installed at the back of the photovoltaic panel, and the whole system is enclosed in a casing in which insulation is installed at the back and sides and a single low-iron glass is installed at the front to reduce the thermal losses (see Figure 9.23). Water is used as a heat transfer medium. FiGuRE 9.25 Hybrid PV/T system schematic. The system also employs eight batteries connected in a 4 X 2 mode, i.e., four batteries in parallel and two in series. The findings from this investigation are very promising. In addition to the increased electrical energy produced by the system, almost 50% of the hot water needs of a four-person family are satisfied with such a system, and because of the heat removal, the PV cells' annual efficiency increased considerably. In another case the application of water PV/T systems in industry has been studied. Water-type PV/T systems were also considered for this application. The PV/T systems can be used in several industrial applications, but the most suitable are applications that need heat in low (60-80°C) and mainly very low (<50°C) temperatures, since in these cases, both the electrical and the thermal efficiency of the PV/T system can be kept at an acceptable level. It should be noted that the fraction of heat demand at low temperatures is high, especially in the food, wine, beer, and beverage industries and in the paper and textile industries, where its shares could be up to 80% of the overall thermal energy needs. For example, water-cooled PV/T systems could heat water for washing or cleaning processes. The PV/T plants could be installed on the ground or on either flat or saw-tooth roofs, or on the façade of a factory (Kalogirou and Tripanagnostopoulos, 2007). Finally, the performance and financial improvement of the PV/T systems was compared to the standard PV systems for building applications and proved very beneficial (Kalogirou and Tripanagnostopoulos, 2006). Additionally, it was proven that PV/T systems could be beneficial to the greater diffusion of PV units. This is especially important for countries with good penetration of solar water heaters, where it is a habit to produce hot water with solar energy. In these cases, it would be difficult to convince potential customers to install a PV system, whereas a hybrid system producing both electricity and hot water has better chances of success. 9.1 Find the wavelength of radiation whose photons have energy equal to the band gap of cuprous sulphide (Cu2S) cell (1.80 eV), compounds of cadmium sulphide (CdS) cell (2.42 eV), and gallium arsenide (GaAs) cell (1.40 eV). 9.2 A beam of blue light with wavelength of 0.46 |im and intensity of 1 mW strikes a solar cell. Estimate the number of photons incident on the cell. 9.3 The dark saturation current of a solar cell is 1.75 X 10~8 A when the cell is at 35°C and the short-circuit current when in sunlight is 4 A. Estimate the open circuit voltage, the maximum power output of the cell, and the number and arrangement of cells required to make a panel to supply 90 W at 12 V.
9.4 A PV system gives 9 A when the solar radiation is 750 W/m2. How many amperes will it give at 850 W/m2? 9.5 A 6 m2 PV system gives 24 V and 18 A when exposed to solar radiation of 750 W/m2. Estimate the cells' efficiency. 9.6 A PV system is required to produce 96 W at 12 V. Using solar cells that have Imax equal to 250 A/m2 and Vmax equal to 0.4 V, design the PV panel, working at the maximum power point, if each cell is 80 cm2 in area. Four lamps, 15 W each, operated from 6 pm-11 pm. Television, 80 W, operated from 6 pm-11 pm. Computer, 150 W, operated from 4 pm-7 pm. Radio, 25 W, operated from 11 am-6 pm. Water pump, 50 W, operated from 7 am-10 am. 9.8 A remote cottage has the following loads. Estimate the daily load and peak power to be satisfied by a 24 V PV system. 9.9 Using the loads of Exercise 9.8, estimate the expected daily energy requirement if the efficiency of the inverter is 91%, of the battery is 77%, and of the distribution circuit is 96%. 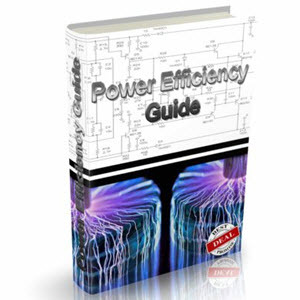 9.10 If the array and the power conditioning system losses are 10%, find the total energy delivered for a grid-connected system, assuming the efficiency of the inverter equals 90%, of the distribution circuit equals 95%, and a grid absorption rate of 90%. The energy delivered by the PV array is 500 Wh. 9.11 A south-facing PV panel is installed at 35° in a location that is at 40°N latitude. If, on May 15 noon, the beam radiation is 685 W/m2 and the diffuse radiation is 195 W/m2, both on a horizontal surface, estimate the absorbed solar radiation on the PV panel. The thickness of glass cover on PV is 2 mm, the extinction coefficient K is 4 m_1, and ground reflectance is 0.2. 9.12 If, for a PV module operating under NOCT conditions, the cell temperature is 44°C, determine the cell temperature when this module operates at a location where Gt = 725 W/m2, V = 1 m/s, Ta = 35°C, and the module is operating at its maximum power point. The dark saturation current of a solar module is 1.7 X 10~8 A/m2 and the short-circuit current is 250 A/m2. 9.13 Using the simple design method, design a PV system using 60 W, 12 V panels and 145 Ah, 6 V batteries. The PV system is required to offer 3 days of storage, the battery efficiency is 75%, and the depth of discharge is 70%. The location where the system is located has 6 h of daylight during wintertime and the application is 24 V with a load of 1500 Wh.